Here are my best movies for 2013. All were released in Japan during the previous 12 months, which means the best film I saw all year isn’t on here. 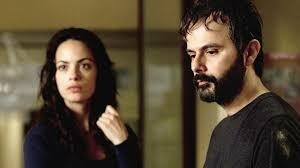 That would be The Past, Asghar Farhadi’s gripping and heartbreaking film about cross-cultural divorce and the soul-crushing effort necessary to keep secrets from loved ones. I saw it in Busan and it will be released here in April, so it will surely be on my list for next year, maybe even at the top. Actually, it’s difficult to gauge the worth of such a movie, whose emotional contours are so carefully molded as to make you suspicious of the director’s purposes, but in any case I can’t think of a movie I’ve seen since Poetry that affected me so directly as I was watching it and stayed with me for so long afterwards. None of the films on this list came close, and, for sure, many of them don’t endeavor to produce that sort of reaction, even the Haneke film, which is probably his most sentimental—if such an adjective can be applied to a Haneke film. Of course, purely emotional responses to movies are something everyone understands, though you can usually tell how “honest” a movie is by the way you feel the next day. I’ve seen enough movies in my life to know that the occasional tear I shed during a particular scene is likely reflexive rather than empathetic, more a reaction to the confluence of structural elements than anything else. And I gladly give myself over to those feelings because being in the moment is what it’s all about. But like some sort of terrible joke you tell during a drunken moment, you think better about it the next day, so just because I welled up during the more dramatic passages of Hope Springs doesn’t mean I bought the premise, only the goods they were selling. And let’s just say I probably would have returned them for a refund once I came to my senses. 1. 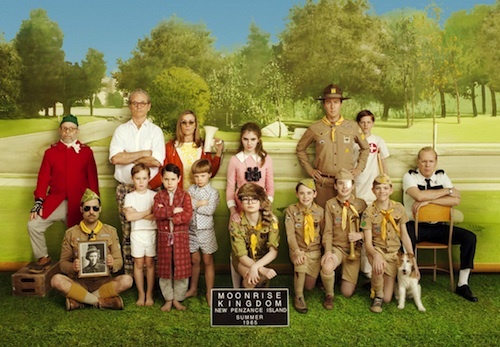 Moonrise Kingdom (USA): Romance and Adventure among the adolescents on a remote New England island, courtesy of that eternal adolescent, Wes Anderson, who’s never been in more assured command of his quirky style, or more serious about his off-center humor. A tale of runaways with reasons and resources, it’s at once a ripping yarn and a potent shot of shamelessly satisfying nostalgia. Adults beware. 2. Barbara (Germany): 1980. A pediatrician (Nina Hoss) is transferred from East Berlin to the sticks after having the gall to apply for an exit visa. She becomes her new colleague’s object of desire even as he’s keeping an eye on her for the local Stasi. In a repressive society nothing is more seductive than resistance, but Barbara represents something more and demonstrates a hardened ability to distinguish true desperation. 3. Tabu (Portugal): More nostalgia, but filtered through layers, one of which is director Miguel Gomes’s deadpan dramatic exegesis, the result being that 1960s colonial Africa is made to look like a trick of the mind, a place where an illicit, slightly comical love affair possesses its own special logic, because in memory all our sins, especially those we commit in the name of progress, get a pass. 4. 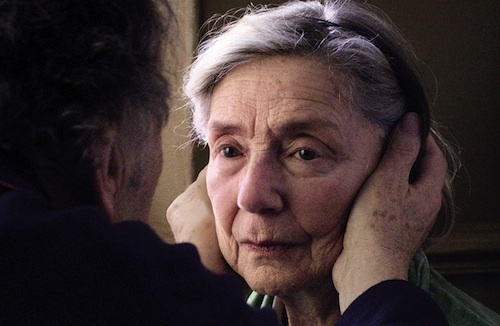 Amour (Austria-France): Eliding the more graphic aspects of physical deterioration, Michael Haneke nevertheless conveys the terror of helplessness one feels as an elderly loved one slowly dies, capturing the unique atmosphere of loneliness in the Paris apartment of Georges and Anne as if it were a function of the light. That he can also retain an air of mystery in all this oppressive sadness is a singular accomplishment. 5. Gravity (USA): Saying that Alfonso Cuaron’s not-quite-sci-fi tour de force is the most intimate blockbuster ever made and one of only a handful that justifies its use of 3D doesn’t do justice to its emotional resonance. As a lone astronaut (Sandra Bullock) floats through space improvising life-saving schemes, the universe becomes a real place, and it’s a shock to realize how much it hates us. 6. Beyond the Hills (Romania): Christian Mungiu takes his time in explicating the breakdown of a young woman who comes to a remote Orthodox cloister to talk a childhood friend into running away with her. The friend is about to take her vows, and whatever affection these two once felt for each other is now qualified by a higher devotion. Pure faith is no defense against the power of romantic delusion. 7. Martha Marcy May Marlene (USA): A subliminal thriller, Sean Durkin’s debut examines the sexual spell a charismatic cult leader (John Hawkes) casts over a young woman (Elizabeth Olsen) even after she escapes his orbit. Believing the mentor is a cad and the acolyte naive doesn’t get you anywhere, though, since the world outside the cult, as represented by the woman’s well-to-do sister and brother-in-law, offers no appealing alternative. 8. Rust and Bone (France): Marion Cotillard is a handicapped animal trainer and Matthias Schoenaerts a brutish boxer in Jacques Audiard’s romantic melodrama, whose emotional impact derives from the principals’ incompatibility as both lovers and personalities. Audiard’s thorough exposition of their socioeconomic situation makes his film so much more than just a love story, but as a love story it’s exceptionally effective. 9. In Another Country (Korea): Hong Sang-soo’s latest comic interrogation of Korean sexual mores brings in a ringer: four French women all played by Isabelle Huppert, who finds four ways to make her Korean male lovers, or would-be lovers, look like fools or heels, depending on the situation. Never has a movie director had more fun with national stereotypes. You have permission to laugh out loud. 10. 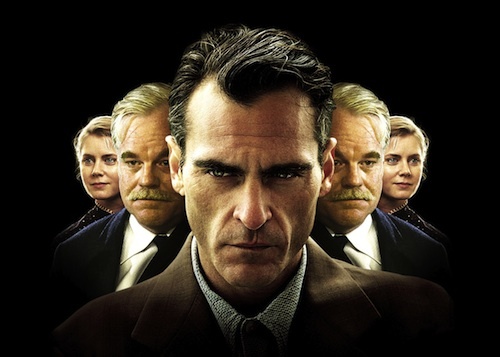 The Master (USA): Paul Thomas Anderson’s free-wheeling storytelling style suits the tale of Freddie Quell (Joaquin Phoenix), a World War II vet whose unusual resistance to psychoanalysis makes him the perfect foil for Lancaster Dodd (Philip Seymour Hoffman), the leader of a new, psychology-based religion. “I’m the only one who likes you,” Dodd tells Freddie, explaining these two characters’ distinct approaches to dishonesty, the great American pastime. Cosmopolis (Canada): The wages of sin are given a literal accounting in Don Delillo’s novel about a young billionaire’s journey to the end of the night, and David Cronenberg’s surreal adaptation makes it God’s own comedy. Pieta (Korea): Kim Ki-Duk’s return to outlandish religious allegory about a brutal debt collector learning to sympathize with a woman who claims to be his long-lost mother is an impressive feat of narrative austerity. GFP Bunny (Japan): The methodical, clinical poisoning of a woman by her teenage daughter is the ostensible “story” here, but Yutaka Tsuchiya seems more interested in how individuals adapt, both evolutionarily and socially. Captain Phillips (USA): This actioner from Paul Greengrass pits a small band of Somali pirates against the helpless crew of a cargo ship skippered by Tom Hanks, but behind him is the intractable force of the U.S. military. Surprisingly suspenseful for a movie whose ending you know from the get go. Caesar Must Die (Italy): Documentary and artifice keep changing places in this study of a staging of Julius Caesar in an Italian prison. The performances become indistinguishable from the behavior of inmate-actors compelled to prove their loyalties, which is what the play is about. This entry was posted in Movies and tagged Alfonso Cuaron, Asghar Farhadi, Christian Mungiu, David Cronenberg, Hong Sang-soo, Matthias Schoenaerts, Michael Haneke, Miguel Gomes, Paul Thomas Anderson, Tom Hanks, Wes Anderson, Yutaka Tsuchiya. Bookmark the permalink.